Q1: How many pieces do you have? I have 553 pieces of the Swing Bridge that will be available for purchase. Q2: What are you doing with the pieces? I am incorporating the pieces into beautiful pieces of art that can be proudly displayed on a wall in your home or office or store, etc… One piece is a laser engraved wall plaque with a piece of the bridge. It features a laser engraved silhouette of an image taken by Jeff Wenzel on 12/4/2018, the last morning the Swing Bridge was in use. The other piece is a canvas with a piece of the bridge. 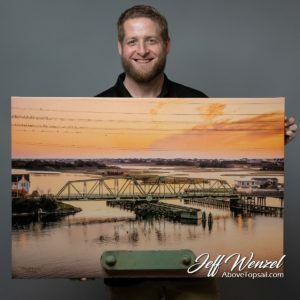 The image on the canvas was taken by Jeff Wenzel on 12/4/2018, the last morning the Swing Bridge was in use. Q3: How much will they cost? The 24×36″ canvas is $675. The 12×16″ plaque is $185. Q4: Is the paint full of lead? Q5: When will they be available for purchase? Pre-ordering began on Friday 1/25/2019. Q6: Can I get a small piece of metal of the Swing Bridge instead of the two pieces of wall hanging art you have published to be for sale? The most difficult and time-consuming part of this project so far was the actual cutting and shaping of the metal. Figuring out a method to cut it cleanly to minimize burn marks or cutting marks then grinding off the rough and uneven edges took a lot of time. But all of that work is now complete. I have every single piece of metal that will be available in its finished condition. Pieces of the Swing Bridge will only be available in one of the two products I have developed. On a side note, I do want to point out that the construction company (Balfour Beatty) who has the NCDOT contractual obligation to remove the Swing Bridge did not have to make any pieces of the bridge available to the public, but chose to slow down their project timeline to be able to do this for the community. I hope many recognize that even though they are a global $10.5 billion a year construction company in business to make a profit, they chose to be sensitive to the emotional attachment of many who love or visit the Topsail community. And yes, count me in as one of those who have special memories of the Swing Bridge. I am truly grateful to Balfour Beatty and am honored they included me to be a part of this project. Q7: Will there be lower cost options available? No doubt, some people will think the prices are too high. I realize I will not make everyone happy. Unlike the Topsail images I sell that are printed on photo paper and canvas, I do not have the option to continue to print more and more Swing Bridge metal and print it in different sizes as different price points. In designing the wall hanging bridge piece art, I intentionally created two different products at two different price points in the hopes that most people could afford a piece if they truly desired to own a piece of Topsail’s history. I also allocated twice the number of pieces of metal for the lower price point. I am confident that the majority of people who see the craftsmanship of the local businesses who I have partnered with to create this art to hang on the wall will realize the value for the price that was set. Q8: Will local retailers be selling the Swing Bridge piece artwork or are the pieces available exclusively through www.AboveTopsail.com? After I have fulfilled all pre-orders, I will begin placing inventory in some of the local retailers that already carry my artwork. As I do not know how many pre-orders will be placed, I do not know how many pieces will be available in retail locations. Q9: Will a portion of the money from the sale of the Swing Bridge piece art be donated to a local charity/organization? From day one, I knew I would donate a portion of the profits of the sales to the Historical Society of Topsail Island. I am a proud member of this organization. The Society is dedicated to the collection, preservation and promotion of the history of the Greater Topsail Island area. It seemed to me this organization’s mission was a perfect match with the Swing Bridge piece art project. When I spoke to a board member early on in the process, I let him know I would be donating a portion of the profits as well as try my best to secure a chunk of metal that could be displayed in the Missiles and More Museum (which is operated and funded by the Historical Society of Topsail Island). I am happy to report a five-foot beam of the Swing Bridge will be displayed for all to see in the museum. If you love Topsail Island or are interested in its rich history, I encourage you to visit their website or visit the Missiles and More Museum when they reopen after Hurricane Florence repairs are completed. Finally, I would encourage everyone to consider becoming a member of the Historical Society of Topsail Island. Q10: Can the art be shipped? Yes. Local pickup or shipped is decided at the time of checkout. The shipping charge includes shipping insurance. Shipping is automatically calculated at 10% of the price. Q11: When will I receive my art? Production of the art pieces will begin in early February and I anticipate the first pre-orders to begin being seen hung in homes and local businesses in March. I expect all pre-orders made in January 2019 to be fulfilled by the end of April. Q12: How rusty are the pieces of the bridge? Q13: How weatherproof are the pieces of art? Although the bridge served faithfully for 63 years in the harsh Topsail coastal environment, I do not recommend either piece of artwork to be hung outside and be exposed to the elements. Q14: Why was Jeff Wenzel of Above Topsail allowed to sell the pieces and no one else? 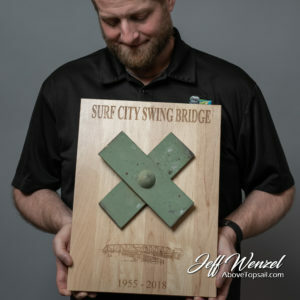 I asked Jay Boyd of Balfour Beatty to explain why they chose to make pieces of the Surf City Swing Bridge available to the public. I also asked him to explain why they reached out and chose to partner with me to help accomplish this. Jay was kind enough to sit down and explain his reasoning. At the end of the day, we are simply trying to make pieces of the bridge available. I realize some people are upset about how this has been implemented and some of my competitors are envious of my position. The Surf City Swing Bridge is tied to so many memories for many who live in our community and visitors. That is why I am proud to be part in being able to make a limited quantity of pieces available. I am grateful for the relationship I have built over time with Balfour Beatty. And I am thrilled that they entrusted me with creating pieces of art that will last a lifetime and can be enjoyed for generations.